Learn how you or your dependents can apply! Get ready to Kick off the 2019 Camping Season with the official Go RVing Dealer tie-in program and help your dealership reach new buyers! Online access to Go RVing leads, prioritized according to purchase time frame. 24 hours a day, 7 days a week, for Go RVing dealers signed up for the tie-in program. Go RVing's 20 Years of Success Posters - set of 3 individual - 22" x 28" Colorful Posters. Splendor, Freedom and Wonder. An attractive addition to your dealership showroom. RV Service Textbooks - Complete 14 Volume Set. For decades RV Technicians have been relying on the RV Service Textbooks to help them increase their knowledge and understanding of RV components and operating systems. 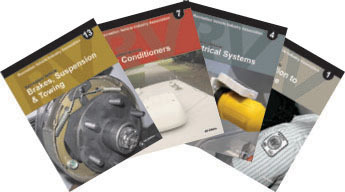 In 2012, RVIA assembled some of the RV industry's leading service experts to thoroughly review and revise the textbook series.